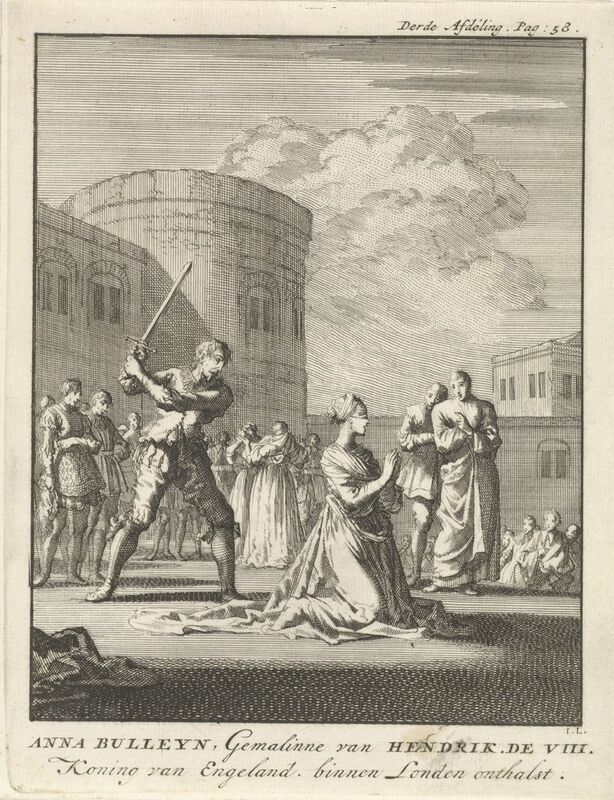 On May 19, 1536, Anne Boleyn, the wife of King Henry VIII of England, was beheaded on Tower Green, part of the Tower of London. Anne Boleyn, the queen consort and second wife of England's King Henry VIII, kneels on the scaffold minutes before her beheading on Tower Green in 1536. Anne was convicted of treason, although most historians agree she was innocent. On May 19, 1536, Anne Boleyn, the wife of King Henry VIII of England, was beheaded on Tower Green, part of the Tower of London. Boleyn had been arrested and accused of treason less than three weeks earlier. Anne Boleyn was Henry’s second wife. Henry’s desire to divorce his first wife (Catherine of Aragon) and marry Anne Boleyn was one of the reasons he and his supporters sought a break with the Catholic Church—the English Reformation. The English Reformation not only allowed Henry and Anne to wed—Henry formed a new Christian church (the Church of England) with himself at the head—but halted English taxes to the Catholic Church. After the English Reformation, English churches were governed by the king and local authorities, not by the Pope in Rome. The English Reformation was a controversial process, and many Catholics blamed Anne Boleyn for the radical break with Rome. Most historians agree that Anne Boleyn was innocent of the charges against her. Despite all the trouble he went to in order to marry her, Henry was just no longer happy in the marriage. Henry wanted a son, but he and Anne only had a daughter, Elizabeth—who later went on to have a decent political career as Queen Elizabeth I. Henry also wanted another wife—Anne’s maid-of-honor, Jane Seymour. Henry married Jane the day after Anne’s execution, had a son (Edward VI). He then went on to marry five more times. The fates of Henry VIII’s wives are easy to remember using a rhyme: divorced, beheaded, died, divorced, beheaded, survived. to take into legal custody. young attendant to a queen, ranking below a lady in waiting. (16th century) religious movement to reform the Catholic Church and resulting in the formation of Protestant churches.